There's nothing like wearing a glitter nail polish to help get your nails Holiday ready. New Essie Luxeffects nail polish is the perfect way to spice up your holiday look. Essie Fashion Flares. I finished the rest of my nails with one coat of Essie Fashion Flares for extra sparkle. Top it off with Essie Gel Setter Top Coat. 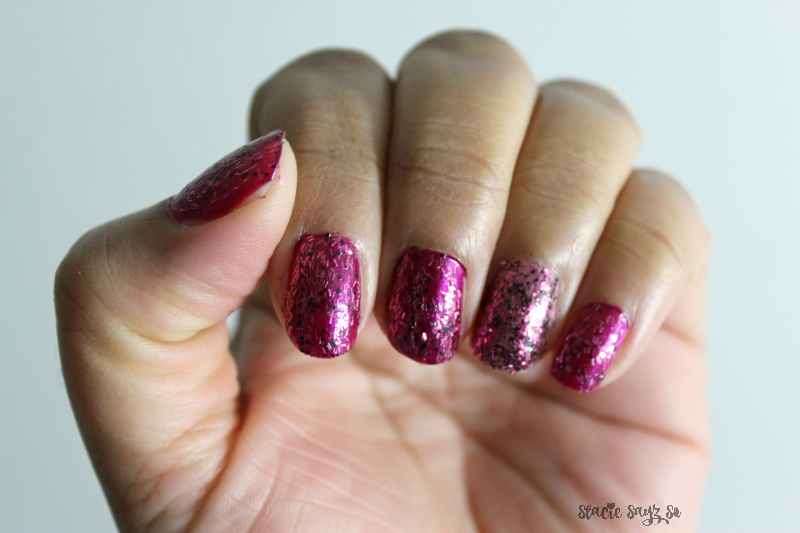 See my review of Essie Gel Setter Top Coat here. Have you tried the new Essie Luxeffects Collection? *I purchased this with my own money. This is a great color, does it take much effort to remove as I seem to have problems with other polishes that have sparkles and glitters inside. Did your nails feel smooth wearing this polish? Looks really nice Stacie! I like the idea of using a clear gel over it. That would give it a smooth finish. To Antionette's question I do think it does take a little more effort to remove. But, the trick is to hold the cotton ball with polish on longer and then wipe clean. Don't you think? Pretty, festive color!